Outdoor UPS | Powerco™ Canada Inc. 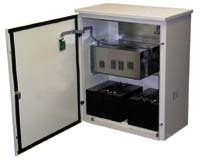 The Controlled Power LTN Series is a UPS designed for harsh environment and outdoor applications. The LTN is available in a NEMA2 rating for indoor harsh enviroment conditions and NEMA 3R & NEMA 3RX configurations for outdoor applications. The LTN Series provides conditioned, regulated, no-break power to loads in high and low temperatures as well as harsh outdoor environments where it is difficult to place a UPS.